Your baby has passed away. Now you are faced with the difficult, but important, need to mourn. Mourning is the open expression of your thoughts and feelings regarding death. It is an essential part of healing. You are beginning a journey that is often frightening, painful, overwhelming and sometimes lonely. This article provides practical suggestions to help you move toward healing. Whatever the circumstances of your baby’s death, you will need to share your grief with a close family member or friend. Whether you were pregnant for a brief time or for many months, delivered a stillborn baby or your baby lived for a longer time, you have every right to grieve. The demise of your baby may have come suddenly, without any warning. You will grieve in your own unique way. Try not to adopt assumptions about how long your grief should last. Consider taking a “moment-to-moment” or “one-day-at-a-time” approach that allows you to grieve at your own pace. The death of your baby affects your mind, heart and spirit. So you may experience a variety of emotions as part of your grief work. Confusion, disorganization, fear, guilt, relief or anger are a few of the emotions you will feel. Sometimes these emotions will follow each other within a short period of time or they may occur simultaneously. These feelings are normal and healthy. Learn from them. Don’t be surprised if you suddenly experience surges of grief, even at the most unexpected times. These bursts of grief can be frightening and leave you feeling overwhelmed. They are a natural response to the demise of your baby. Find someone who understands your feelings and will allow you to talk about them. Feeling dazed or numb when your baby passes away is often part of your early grief experience. This numbness serves a valuable purpose; it gives your emotions time to catch up with what your mind has been told. You may feel as if the world suddenly came to a halt. Your plans and dreams for the future are lost. You may feel you are in a dream-like state. As one mother said, “It’s like running headfirst into a solid wall. I was stunned and didn’t want to believe the words I was hearing. I wanted someone to wake me up and tell me this wasn’t happening.” Feelings of numbness and disbelief help create insulation from the reality of the death until you are more able to tolerate what you don’t want to believe. Some people may try to hurry you into decisions to protect you from feeling sad and lost. They often mean well, but they are also potentially complicating your healing. You should not make any major decisions until you begin healing. If possible, attempt to make decisions with your spouse or a compassionate friend. Realize that you will probably have differences of opinion. That’s all right; your grief is unique. If you do disagree, respect each other’s right to do what feels right individually. For example, one of you may want to see and hold the baby, while the other does not feel the need to. Only you can decide what your needs are related to seeing and holding your baby after the death. But, one thing is certain-you should be given the option. Many parents value this opportunity to say goodbye (and sometimes hello if the death was a stillbirth or premature delivery.) There is nothing wrong with wanting to see, hold and touch your baby. Don’t make rash decisions about this. Take time to think it over. If you have fears about what your baby might look like, ask the doctor or nurse to describe your baby’s appearance. If you decide to see and hold your baby, spend as much time as you need with your baby. Even a short time will go a long way toward helping you heal. Even if your baby never lived outside the womb, he or she deserves a name. If you had already decided on a name, keep it. This name truly belongs to this unique child. Having a name for your baby allows you to talk about your loss in a personal way. You are openly acknowledging that you have loved a child and will always remember him or her. Later, you will find it easier to embrace your memories if you can refer to your baby by name. Memories are one of the best legacies that exist after a baby passes. You may want to collect some important keepsakes that help you treasure your memories. Some hospitals automatically offer to provide you with ways of remembering your baby. You can request any items that you want to be able to keep. Examples of keepsakes you might want include the following: a picture of your baby (even if you don’t want it now, you might later), a birth certificate, a set of footprints, the plastic arm bracelet from the hospital, the blanket your baby was first swaddled in or a lock of hair. You may want to create a memory box to store these special keepsakes in. Then, when you are missing your baby, you can open the memory box and embrace these special memories. The reality that your baby has passed away does not diminish your need to have these objects. They are a tangible, lasting part of the special relationship you had with your child. The funeral ritual does more than acknowledge the death of your baby. It helps provide you with the support of caring family and friends. The funeral is a way of giving testimony to the life and death of your child. Most importantly, the funeral is a way for you to express your grief. You might have some people tell you, “It will be easier (or better) not to have a funeral.” Actually, choosing not to have a funeral is a decision many parents later regret. You and your baby have a right to have a funeral. The funeral is one thing you can do for your child at a time when you feel so helpless. 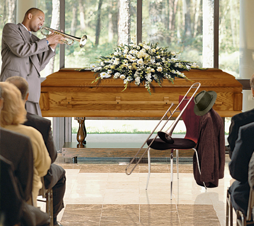 Funerals do not have to take place right away. Take your time and decide what will best meet your needs. Whatever you do, don’t have a funeral that excludes the mother. Wait until she is out of the hospital and can be included in the service that remembers her baby. Feelings of loss and sadness will probably leave you fatigued. And your low energy level may naturally slow you down. Respect what your body and mind are telling you. Nurture yourself. Get daily rest. Eat balanced meals. Lighten your schedule as much as possible. Caring for yourself doesn’t mean feeling sorry for yourself; it means you are using natural survival skills. Express your grief openly. Sharing your grief with others allows for healing. Ignoring your grief won’t make it go away; talking about it often makes you feel better. Speak from your heart, not just your head. Doing so doesn’t mean you are losing control or going “crazy.” It is a normal part of your grieving process. Find caring friends and relatives who will listen without judging. Seek out those people who will embrace you in your journey through grief. Avoid people who are critical or who try to steal your grief from you. They may tell you, “You can have another baby” or “You never even got to know this baby!” While these comments may be well-intentioned, you do not have to accept them. You have every right to express your grief. If faith is part of your life, express it in ways that seem appropriate to you. Be around people who understand and support your religious beliefs. If you are angry at God because of the death of your baby, embrace this feeling as a normal part of your grief work. Find someone to talk with who won’t be critical of whatever thoughts and feelings you need to explore. You may hear someone say, “With faith, you don’t need to grieve.” Don’t believe it. Having faith does not insulate you from needing to talk out and explore your thoughts and feelings. To deny your grief is to invite problems to build up inside you. Express your faith, but express your grief as well. You may find yourself asking, “Why did my baby have to die?”, “Why this way?” “Why me?” This search for meaning is another normal part of the healing process. Some questions have answers. Some do not. Actually, healing takes place in the opportunity to pose the questions, not necessarily in answering them. Find a supportive friend who will listen responsively. To love is to one day mourn. You can’t heal unless you openly express your grief. Denying your grief will only make it more confusing and overwhelming. Embrace your grief and heal. Reconciling your grief will not happen quickly. Remember, grief is a process, not an event. Be patient and tolerant with yourself. Never forget that the demise of your baby changes your life forever. It’s not that you won’t be happy again; it’s simply that you will never be exactly the same as you were before the baby passed away. The experience of grief is powerful. So, too, is your ability to help yourself heal. In doing the work of grieving, you are moving towards a renewed sense of meaning and purpose in your life.